This perfect ultra modern holiday home has a fabulous kitchen (with a view), 2.5 luxury bathrooms, various lounge /relaxation spaces, 3 large bedrooms with a large rumpus room used as a 4th and a sensational 15 metre swimming pool. The large recently renovated house comes fully self contained with all linen and towels supplied. The house has all new and modern appliances as well as a large smart TV with Netflix, Foxtel Sports and NBN Broadband connected. Located in the exclusive "Pacific Heights" estate in Cumbalum, it's hard to believe this secluded property with picture perfect views over rolling hillside can be so easily accessed on sealed roads right up to the door and is only a few minutes drive inland from Ballina and the Ballina /Byron airport. The Gold Coast International airport is about 45minutes driving time. As a base for exploring the area it is amazingly central with Byron Bay, Bangalow, Lennox Head and the best beaches all 10 - 20 minutes driving time. This assumes you will ever want to leave the house once you arrive and start to relax. Awake from a peaceful slumber on crisp clean sheets in your fabulous king sized bed as the 1st rays of the sun light up the emerald green hills and the white Egrets glide in to gather their breakfast in the grassy paddocks. Wander down and say good morning to the horses whilst your coffee brews then sit back and soak up the splendor of the beautiful valley that stretches out below. Take a refreshing dip in the swimming pool to clear any cobwebs and then a walk around the park-like grounds to spot the ample birds and wildlife. The area abounds with interesting hinterland restaurants such as "Harvest" at Newrybar or try the beach-side cuisine just down the road at Lennox Head. My husband and I run tourist resorts in the beautiful Northern Rivers. This is our premiere property suitable for small groups and family get together's. The property and all linen is professionally cleaned and beautifully presented. The property has a perfect aspect being located on the Northern side of a ridge it has shelter from the cooler and stormier Southerly winds and receives the refreshing Nor Easterly breezes on the warmer days. The Northern Rivers area is famous for rolling emerald green hills on show in the spectacular valley that stretches out below the property. This is a location with serenity and a view you will find yourself just stopping to take in. Yet just a few minutes on a sealed road takes you to the major M1 arterial road to quickly access all of the sensational Northern Rivers finest attractions such as Byron Bay, Bangalow and Lennox Head. We keep our 3 horses on the property and their presence fulfills the presentation of a perfect rural retreat. Our house has been built around a large centrally located kitchen, dining, lounge and relaxation area with a spectacular valley view on one side and an outlook over the 15M swimming pool and gardens on the other. The opposing ends of the house have an accommodation wing with at least one of the two large modern bedrooms in each wing having a dramatic view over the valley. The Eastern wing has two bedrooms with built in robes, the main having a new king sized bed and separated from the other bedroom by a large bathroom with a door leading to each. This bathroom is huge and has a WC and large walk in shower. We have installed two single king sized beds in the second bedroom in this wing which can be combined if a king sized bed is required. The Western wing has a large bedroom with built in robes and a queen bed installed. There is another single bed in this bedroom that may be suitable for a second adult or a child.The bathroom has a bath as well as a large shower and a WC in a separate room. Adjoining this area is a large room with lounge and lounge chairs as well as a queen sized bed and built in robes. The property is an amazing retreat located on a no through fare sealed road with no road noise, an incredibly tranquil setting, sunny aspect and unexpectedly easy access to the M1 motorway to easily get you around the Northern Rivers. We run resort properties in the area and provide crisp clean linen in our professionally cleaned properties. You will find all appliances are new and first class and NBN, WiFi, Netflix, Stan and Foxtel sport are all provided. The bathrooms have been recently fully renovated and have all the most modern amenities with quality fittings, stylish basins and stone topped vanities. The showers have twin rose heads with a large overhead shower-head and additional hose mounted hand held shower-head. The bathroom adjoining the bedrooms in the Eastern wing has twin basins set in a new stone topped vanity unit with a super spacious shower recess and private garden view through shuttered windows. This large room also has a WC and walk in robe area with dual access from both bedrooms. The bathroom serving the Western wing has a modern free standing bath with a beautifully shaped hand basin styled in complimentary form. There is also a spacious shower fitted with one of the latest fashions in twin rose shower heads. The WC is in a separate adjoining room. The beautiful Lennox Head Beaches are a 10 minute drive over the hill whilst the closest beaches are at Shelley Beach in East Ballina. The Villa is perched on a ridge with extensive views across the valley towards Tintenbar Hill and the green hills of the Byron Hinterland. oil heaters provided but rarely necessary due to our lovely climate. Brand new 2018 Fisher and Pychel machine. Fake fireplace electric heater. Rarely required in our climate. double carport at door. Many spaces available. 2 separate relaxation lounge areas in the house's central section with new and very comfortable chaise lounges & flat screen TVs. Fabulous brand new LG french door fridge and freezer with ice maker and chilled water compartments. brand new Sharp inverter model. Newly renovated with stone bench-tops, large breakfast bar and so many storage spaces. The full walk in pantry and kitchen have 30 drawers installed as well as many other handy cupboards and shelves. Large dining table in the formal dining area with comfortable setting for 6 people but large enough to seat 8. 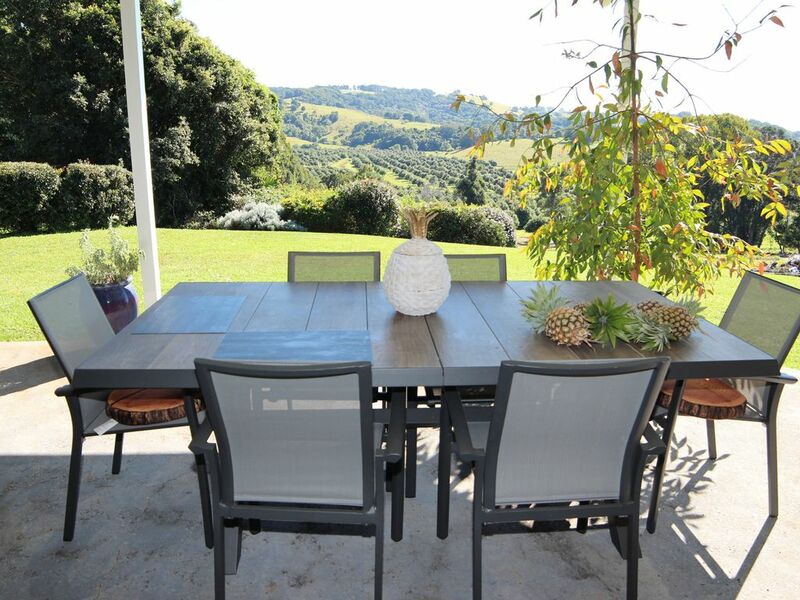 The outdoor dining table on the patio is extendable with 10 seats for the entertainer. With fabulous views and 10 seat entertainer's dining table. Teven Golf Course 4 Klm, Ballina Golf Course 8 Klm, Byron Bay 15 Klm, Ocean Shores 25Klm. The house has some split levels and the entry foyer and accommodation wings in the house are at a level 3 steps above the living and relaxation areas. We very much enjoyed our stay at beautiful Cumbalum. We arrived late at night to the lights left on for us and plenty of goodies and necessities like milk, bread, fresh fruit, tea, coffee and chocolate waiting for us. The house was immaculate with clean linen, plenty of towels and everything we needed ( a lovely generous bonus having adequate toilet paper, hand soap and shower gel provided). We woke to stunning views, birdlife and horses grazing. The kids enjoyed climbing the huge jacaranda tree and playing on the swings. Due to the weather we didn’t quite make it into the pool - maybe next time! The house is very comfortable with furnishings that make you feel at home and there is so much space to spread out. Great bathrooms and showers and kitchen facilities. No arguments as more TVs and better internet/ Netflix service than we have at home. We really enjoyed having some wine and cheese in the evenings while watching the sun go down - great place to relax! Thanks Judy, we’ll be back soon! Hinterland of Ballina / Byron Bay.